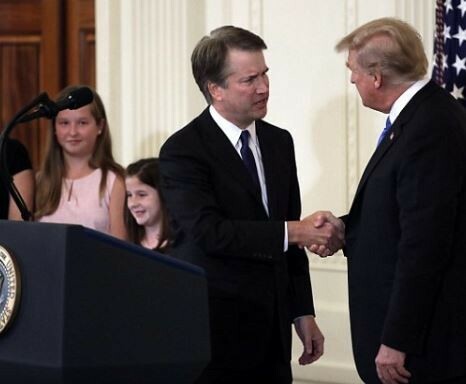 President Donald Trump has named Washington, D.C. federal judge Brett Kavanaugh to fill a vacancy on the U.S. Supreme Court following Anthony Kennedy's exit. 'Judge Kavanaugh has impeccable credentials, unsurpassed qualifications and a proven commitment to equal justice under the law. There is no one in America more qualified for this position, and no one more deserving,' Trump said in his announcement. The President described Kavanaugh as 'one of the sharpest legal minds of our time' and urged the Senate to confirm his pick quickly. This incredibly qualified nominee deserves a swift confirmation and robust bipartisan support,' Trump said. 'Mr. President, I am grateful to you, and I'm humbled by your confidence in me. Justice Kennedy devoted his career to securing liberty. I am deeply honored to be nominated to fill his seat on the Supreme Court' Kavanaugh said.